See also Juliette Cloned by mvstdone. I started out quite enthusiastic about this one but now I've cooled somewhat. Info: Created on 25th September 2008 . Last edited on 23rd June 2009. You've done it! Clean, consistent, and uncompromisingly you. The only thing that bothers me an eentsy bit is the triangle sticking above the x. The lowercase k is very attractive and the comma is just masterful. Yes I think you're right about that x. Why gild the lily? Encouraged by the sight of that little pink dot I am pressing on with an upper case, and I'm glad I did. Interesting issues crop up. Should it be Davida-like or vaguely medieval? I'm inclined to not press the swaying K/k/X/x button too much, which is why I've banished the alternates I was going to use to "more latin". Less is more. The font is already festooned with quite enough jaunty little flicks, probably. I've made some slight changes since this sampler -- lower case x and t.
very elegant. hope you get enthusiastic again, i'd love to see the extended set. I need to bone up on diacritics by studying "proper" fonts to see how it's done. 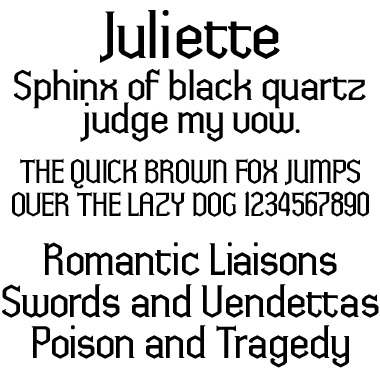 I've attempted them with only one of my fonts (Empyreus) but I'm embarrassed about them, they look fairly bad. So for the moment it will be just the super useful glyphs I'll do like the soft-hyphen and the more common of the diacritics. Yes! there is a recognizable Intaglio style..